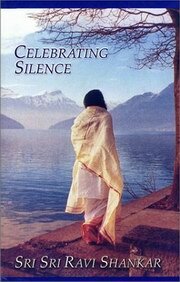 Celebrating Silence is a collection of the weekly discourses (1995 to 2000) organized by theme rather than by chronological order. Sri Sri discusses topics ranging from doubt and fear to love and dispassion. He describes what it means to be on a spiritual path - a path of service, sadhana, and surrender. He leads us through an understanding of God and back to our inner Self - that which we really seek, often without knowing. Sri Sri Ravi Shankar, spiritual guru and founder of the Art of Living movement, believes in spreading the knowledge of living a healthier life through his message of compassion, commitment to society, and a cosmic understanding of life. Born on May 13, 1956 in the southern Indian state of Tamil Nadu, Ravi developed an inclination and an amazing acumen for the study of the ancient Vedic scriptures. By the age of 17, he obtained an advanced degree in Modern Physics, and later received an Honorary Doctorate from Kuvempu University, Karnataka, India.At an early age his father, R S V Ratnam delegated him to the care of Maharishi Mahesh Yogi, a renowned spiritual master. After attaining his degree in science, Ravi joined Maharishi's entourage, taught the Vedic pundits at Maharishi's charities, and soon became the Maharishi's favourite disciple. In 1982, Sri Sri Ravi Shankar went into ten days of silence and emerged as an enlightened master. It is believed that during this time he cognized the famous Sudarshan Kriya breathing technique. In order to spread the kriya and other related knowledge, Sri Sri subsequently set up the Art of Living (AOL) Organization in 1982.Today the Art of Living Foundation is the world's largest volunteer based Non-Governmental Organization, active in over 140 countries. Its service projects, programs on yoga, meditation and stress elimination have benefited over 20 million people representing all walks of life, religions, cultures and traditions with its 5Hs program in the areas of Health, Homes, Hygiene, Human Values and Harmony in Diversity. Sri Sri Ravi Shankar founded the International Association for Human Values (IAHV) in 1997, which undertakes development projects in thousands of villages, bringing self-reliance to millions of people from Afghanistan to Bosnia, Iraq to New York. Sri Sri is the recipient of numerous honors including the "2005 Global Humanitarian Award" by the state of Illinois, "Guru Mahatmya" award by Government of Maharashtra, India, the title of "Yoga Shiromani" by President of India, the Phoenix Award from the Mayor of Atlanta, Georgia, only to name a few… He was a guest speaker at the Millennium World Peace Summit during the 50th anniversary of the United Nations. Sri Sri is also a member of the Council of the Divinity School at Yale University. Sri Sri Ravi Shankar travels extensively across the globe to inspire youth to work together for a better society. As he says, "Religion is the banana skin and spirituality is the banana. The misery in the world is because we throw away the banana and are holding on to the skin." Sri Sri believes that all religions and traditions have a common value system, and these shared values have to reach every corner of the world in order to make it a better place for all.